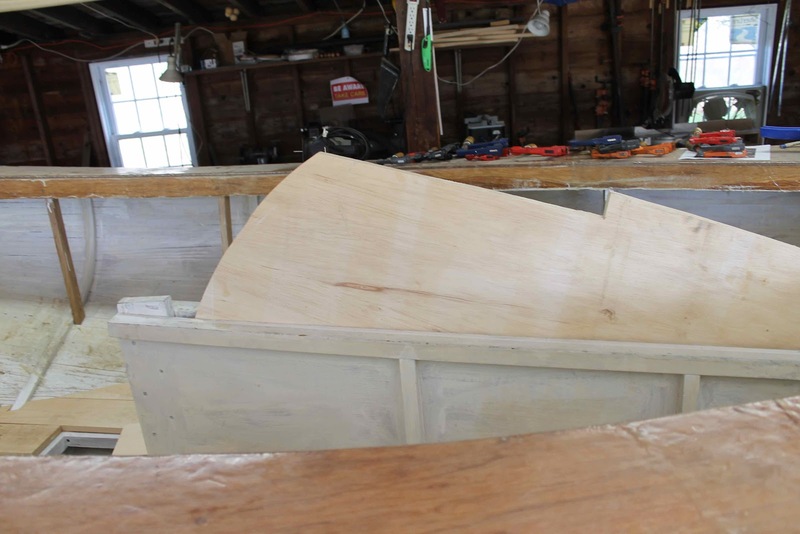 Although our Blog has been very quiet since the end of winter term our little boat shop has not. Here is a much overdue up-date as to our progress. First off we have become a club, now known as the Wooden Boat Builders Club (WBBC). Catchy. We meet evenings when we can and some Sunday afternoons. It's mostly students from the winter program but I'm hoping to snag some new blood before the end of the year. 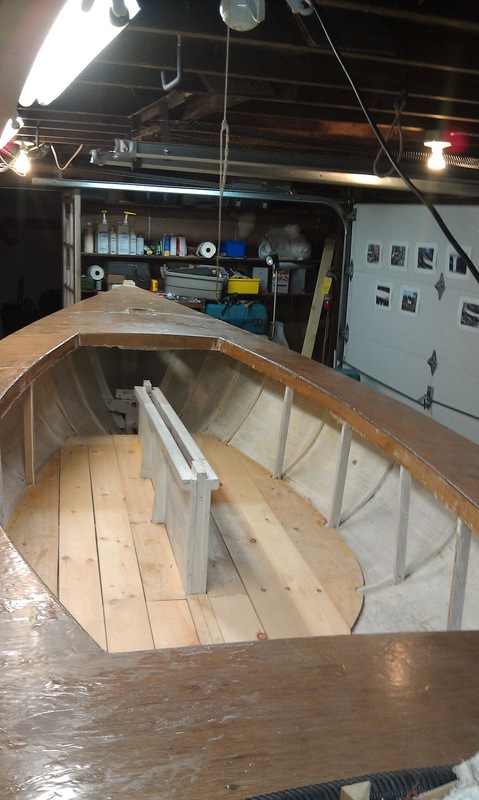 Since the deck was fiberglassed we have begun to sand in preparation for painting. The dust is toxic and the sanding is slow going but we are making real progress with our super duty 7" sander. Oh and of course we all have respirators. The floor boards are all cut and fitted and are being sanded for painting. This should happen this week. Today we are fitting the boat harness with industrial casters so we can begin to roll it in and out of the garage to take advantage of the increasing daylight. 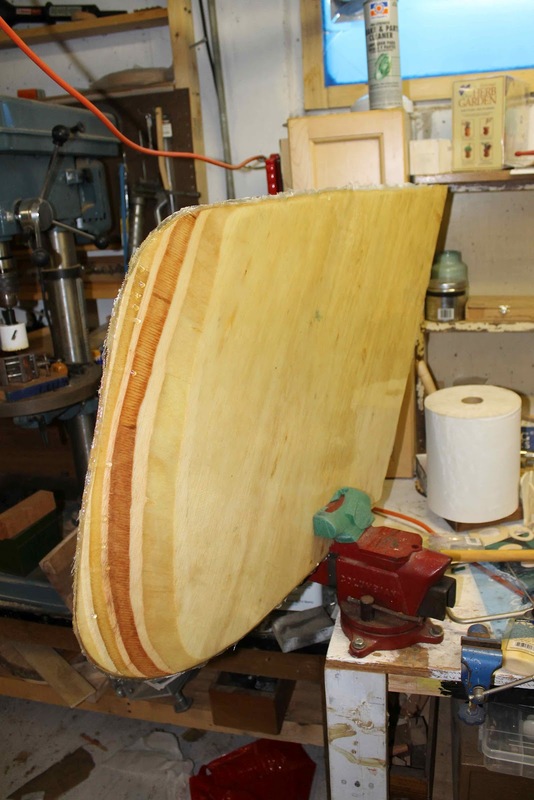 The rudder and centerboard have been glued, cut, molded, shaped, messaged, talked about and finally fiberglassed. 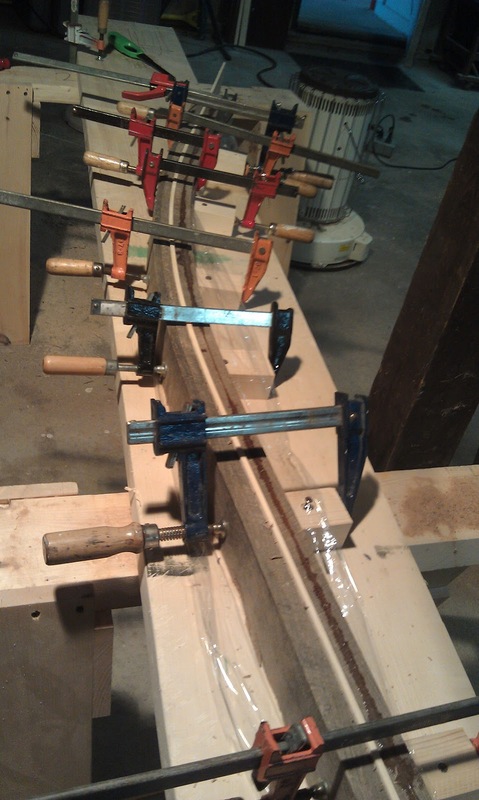 I ordered 5 1/8 x 2 x 12" brass bars for attaching the rudder to the rudder post. The trick here is to bend the bars around the 1" brass rudder post and in order to do that I need to get it hot. My fist attempt went really well until the bar snapped in half. Not enough heat. I have the one extra bar so no harm so far but I've got to get it the next time or it will start to cost. The tiller is glued and will be ready for shaping tomorrow or the net day. It's all very exciting!